1. Q. WHAT IS A LETTER OF REPRIMAND AND WHERE CAN ONE BE FILED? Download "1. Q. WHAT IS A LETTER OF REPRIMAND AND WHERE CAN ONE BE FILED?" 1 1. Q. WHAT IS A LETTER OF REPRIMAND AND WHERE CAN ONE BE FILED? 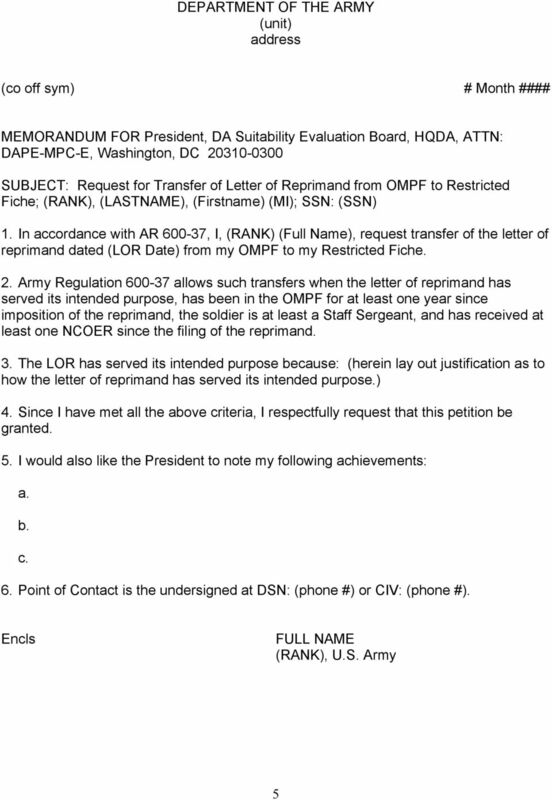 A letter of reprimand (LOR) is an administrative censure or chewing out given to a soldier for a failure to comply with established standards. IAW AR (Unfavorable Information), Chapter 3, a letter or reprimand may be filed in either your Military Personnel Record Jacket (MPRJ) or your Official Military Personnel File (OMPF). 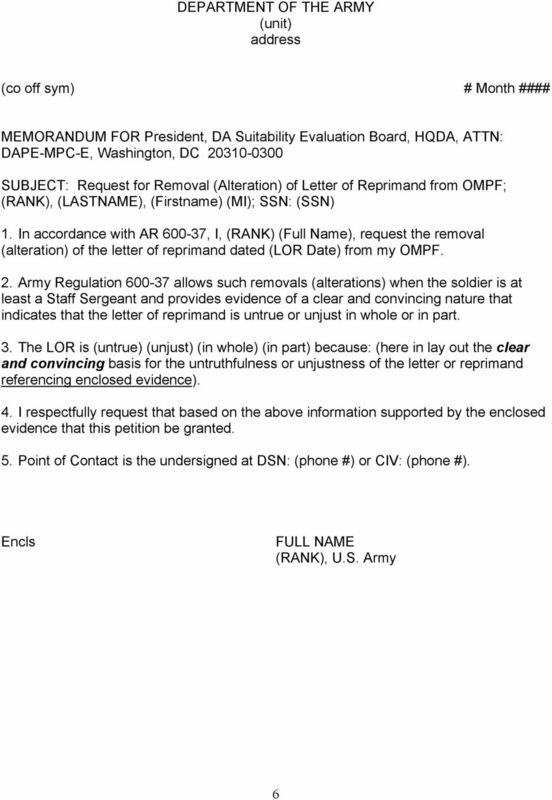 A LOR filed in a soldier s MPRJ can only be made by an enlisted soldier s immediate commander (or a higher commander in his/her chain of command), school commandant, any general officer or an officer exercising general court-martial jurisdiction over the soldier. 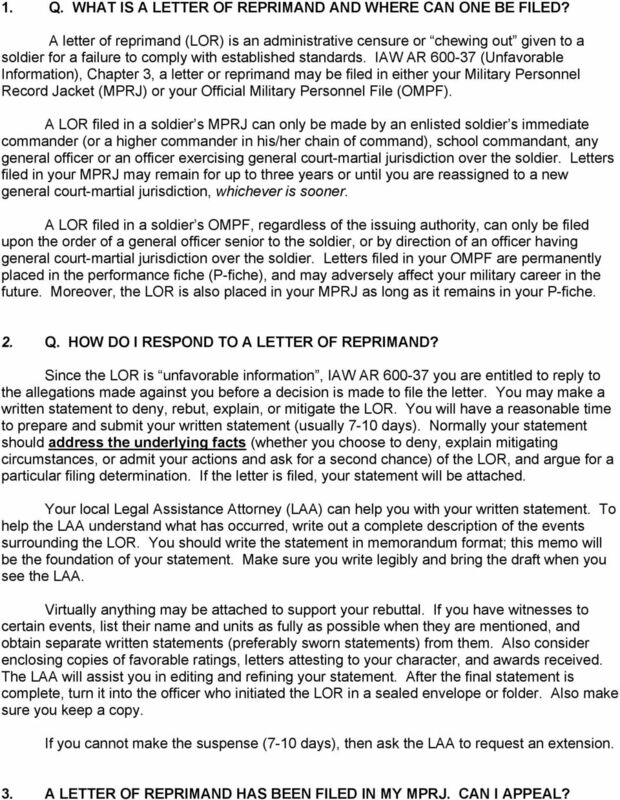 Letters filed in your MPRJ may remain for up to three years or until you are reassigned to a new general court-martial jurisdiction, whichever is sooner. 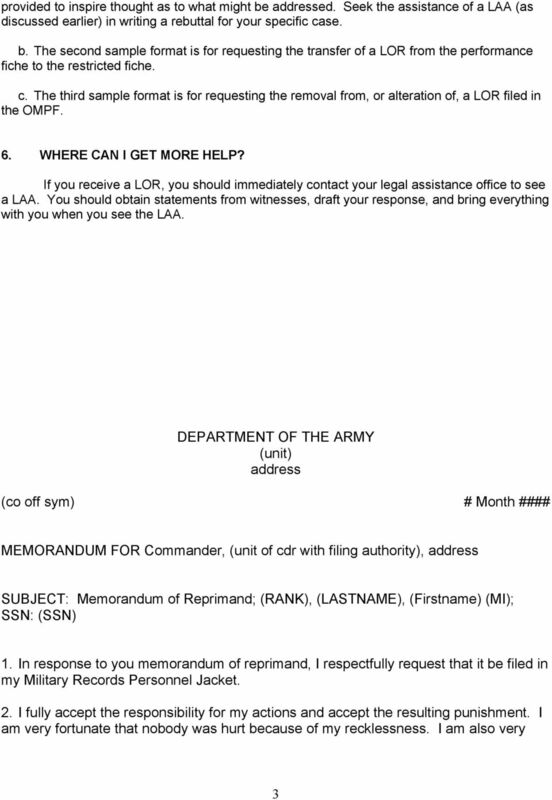 A LOR filed in a soldier s OMPF, regardless of the issuing authority, can only be filed upon the order of a general officer senior to the soldier, or by direction of an officer having general court-martial jurisdiction over the soldier. Letters filed in your OMPF are permanently placed in the performance fiche (P-fiche), and may adversely affect your military career in the future. Moreover, the LOR is also placed in your MPRJ as long as it remains in your P-fiche. 2. Q. HOW DO I RESPOND TO A LETTER OF REPRIMAND? Since the LOR is unfavorable information, IAW AR you are entitled to reply to the allegations made against you before a decision is made to file the letter. You may make a written statement to deny, rebut, explain, or mitigate the LOR. You will have a reasonable time to prepare and submit your written statement (usually 7-10 days). Normally your statement should address the underlying facts (whether you choose to deny, explain mitigating circumstances, or admit your actions and ask for a second chance) of the LOR, and argue for a particular filing determination. If the letter is filed, your statement will be attached. Your local Legal Assistance Attorney (LAA) can help you with your written statement. To help the LAA understand what has occurred, write out a complete description of the events surrounding the LOR. You should write the statement in memorandum format; this memo will be the foundation of your statement. Make sure you write legibly and bring the draft when you see the LAA. Virtually anything may be attached to support your rebuttal. If you have witnesses to certain events, list their name and units as fully as possible when they are mentioned, and obtain separate written statements (preferably sworn statements) from them. Also consider enclosing copies of favorable ratings, letters attesting to your character, and awards received. The LAA will assist you in editing and refining your statement. After the final statement is complete, turn it into the officer who initiated the LOR in a sealed envelope or folder. Also make sure you keep a copy. If you cannot make the suspense (7-10 days), then ask the LAA to request an extension. 3. A LETTER OF REPRIMAND HAS BEEN FILED IN MY MPRJ. CAN I APPEAL? Sample of Locally Developed Questions List Questions selected or self-created will be added to the survey during the request process. Requesting organizations can select up to ten locally developed questions. 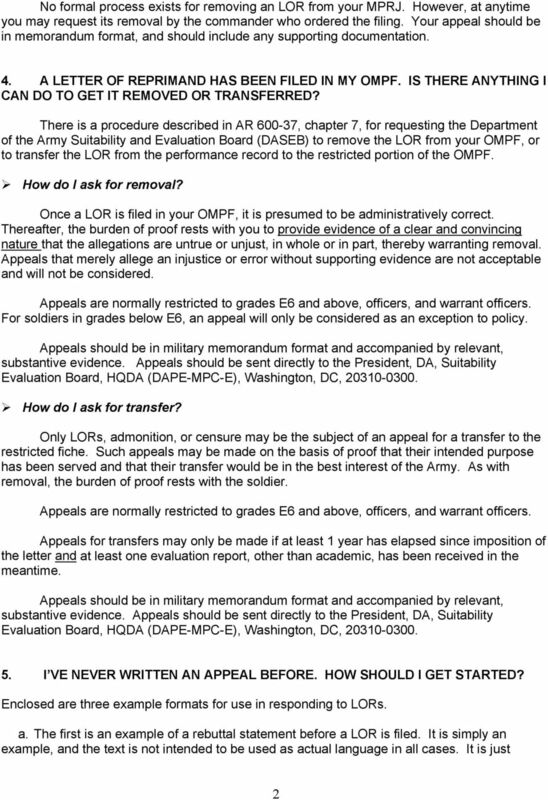 The DD forms are retained according to the DoD policy detailed below. Immediately request a postponement if you or your witnesses are not available to attend the scheduled hearing. Department of Health and Human Services DEPARTMENTAL APPEALS BOARD Civil Remedies Division John Crews, III, M.D. (NPI: 1629169974), Petitioner v. Centers for Medicare and Medicaid Services. Docket No. Military Evaluation (OER & NCOER) Rater and Senior Rater Information Purpose: to provide basic information on military evaluations (IAW AR 623-3 policy) with an emphasis on Rater and Senior Rater profiles. Army Regulation Administration. Gifts and Donations. Headquarters Department of the Army Washington, DC 15 November 1983. Introduction (916) 653-0799 (800) 952-5665.
a. Cadet Command Policy Memorandum 9 - Serious Incident Reporting, 3 September 2009. See Enclosure 3. Law Enforcement Officers Bill of Rights. Sections 112.532-534, F.S. 112.532 Law enforcement officers' and correctional officers' rights. IN THE UNITED STATES DISTRICT COURT FOR THE DISTRICT OF MARYLAND ) ) ) ) ) ) ) ) PETITION FOR A WRIT OF HABEAS CORPUS PURSUANT TO 28 U.S.C. Commandant United States Coast Guard 2100 Second Street, S.W. 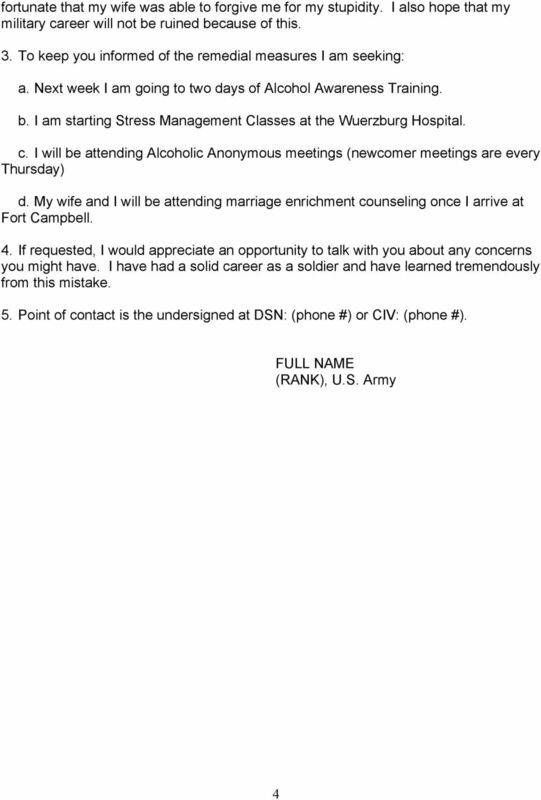 Washington, DC 20593-0001 Staff Symbol: CG-112 Phone: (202) 475-5183 Fax: (202) 475-5909 Email: Robert.m.pekari@uscg.mil MEMORANDUM From: D.